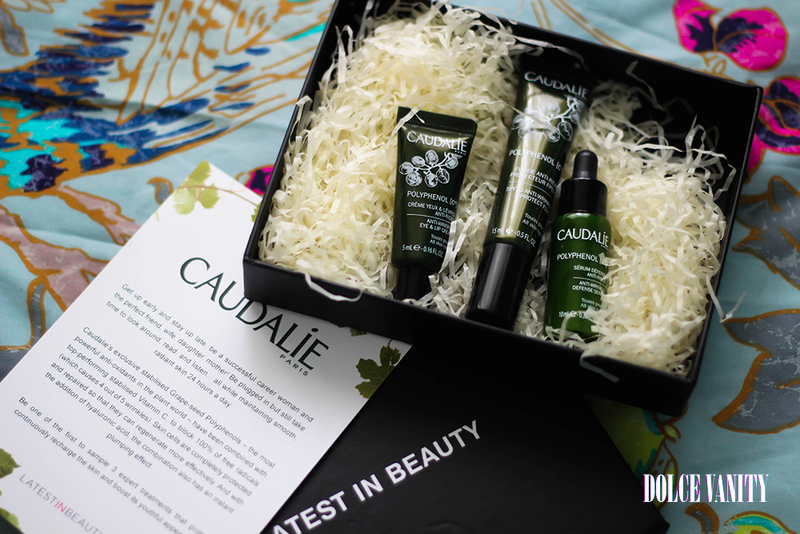 It's always a good job to have samples of skin care to see how they work before throwing down the big bucks and the Caudalie Polyphenol C15 range is no difference. Lucky for anyone who wants to try it Latest in Beauty teamed up with them to bring you 3 of the products out of the range. This double-action gel-cream reduces dark circles and smoothes the area around the eyes and lips. The Polyphenol + Vitamin C anti-oxidant, anti-wrinkle formula is enriched with Matrixyl 3000 and fern, horse chestnut, liquorice and witch hazel extracts. Instantly tightening, smoothing and moisturising. I used theis to prep a clients skin the other day, to smooth the under eyes and lips. The smallest amount is used, I could see this lasting for quite a while. Used it on my own skin as I have dark circle issues can't comment on it too much if it works but it has to be one of the least greasy eye creams I've ever used. This multi-purpose Polyphenol + Vitamin C anti-oxidant and anti-wrinkle treatment also contains sun filters to protect against UVA and UVB rays. Enriched with hyaluronic acid, it also has a plumping action. As soon as it is applied, the skin is smoother, more filled out and perfectly protected all day long. It's ever so light weight and surprisingly it absorbs quickly but leaves the skin moisturised. I think it's perfect for anytime of the year, if you find you may need more in drier months, I don't think there would be an issue to put added moisturiser on top. The skin is soft to touch. As it's for anti-wrinkle, with plumping action, I would suspect that it's going to help fill out wrinkles that have occurred and further prevention of any more. This Polyphenol + Vitamin C anti-oxidant, anti-wrinkle concentrate blocks free radicals (the main cause of wrinkles), corrects and defends the skin against the aggressions of daily life (UV rays, pollution). I love serums and I gave this a go, anything that blocks free radicals is game in my book. All these products absorb extremely quickly but there also products where less is more and you still feel the good effects. Their RRP is between £26 - £35 so if you want to try these you could grab these samples at a steal price instead.